What is it about the British and the Euro? Most countries have signed up to the currency and it is great. You can travel from Northern Germany through any country [except Switzerland] down to South Portugal, and never have to change your currency. You can look on-line for holidays, and know exactly how much they are going to cost. You can compare prices when on holiday and know a bargain from a rip-off. Businesses must love it. They know prices at all times without having to worry about exchange rates. They can print off brochures, and the only thing they have to worry about is language. I wanted to go to France last year [I want to go this year too, but the coffers are a bit low now]. I looked up French websites and knew exactly how much it would cost. I booked a place on-line. And what did they do? They asked for a cheque in Sterling! It transpired the gite was owned by an English woman, and of course they have to be difficult. And awkward. At one point I e-mailed them and asked what kind of power sockets they had. As far as I can gather, the only reason the British don’t want to change is because Sterling is British. Rule Britannia and all that. So, come on Britain. Grow up. Join the rest of the kids in the playground. I can travel across Europe and not worry about exchanging currency. I just want to be able to drive a few miles up the road and over the border without having to come back with a load of useless coins in my pocket. sensible as the euro may be, i miss irish money, the pretty colors, the harps, the poets…. yes, there’s a lot to be gained by joining the EU and using that ugly soul-less euro coin. but something is lost, too. currency doesn’t identify a country as much as language and culture, but it certainly is a part of a country’s identity, or it used to be. Grandad you could always send me your change! As a poor ould widow woman…(violins playing) where is my hankie? @JC – Like it! I can hear the music now. Was the map the inspiration? @Grannymar – If [when] you change to the Euro, your pension will jump up by 50%. Just think of it. £10 becomes €15. i’m not all that irish, granddad. i cant play the uiellean harp. nor spell it. i did take fiddle lessons for a few years. but i had to quit when my teacher finally took me aside and told me, sadly, that i must quit because i am tone deaf and the lessons were, quite frankly, driving her insane. that must be the german in me. In theory, it wouldn’t bother me in the slightest, but what would really get to me is that if Britain did switch to the Euro, we’d end up getting shafted in the same way as Irish consumers did when the Euro came in. I know exactly how much retailers screwed us when the change happened, because I worked in retail at the time. Something cost five Irish pounds and now it’s €6.35? Ara sure, let’s just make that €6.99. There was no rounding down done. Ever. @Laurie – thats OK. I can’t play the uiuillieeann thingy pipes either. But you do drink Guinness and know about Irish currency. @Kav – Exactly. The rest of us had to suffer. Now it’s your turn. My turn to suffer twice? Go ‘way outta that you oul codger. 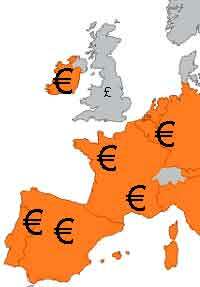 Besides, the Brits haven’t told you yet, but their plan is to turn all of Europe to Sterling by the year 2010. It’s going to be called the New Commonwealth Initiative. Sorry – had to pause there ’til I stopped laughing. Can’t you see the way Blair is half way up Bush’s backside?? You will be changing to the Dollar within five years. Mark my words! and given the way the dollar has been tanking, the whole EU would be plunged into a depression….